Historically, the possibility that schizophrenia can arise in middle or old age was supported by Emil Kraepelin, Eugene Bleuler and Manfred Bleuler. For very late-onset cases the British school used a specific diagnosis like late paraphrenia. However, until DSM-IIIR, clinicians in the United States did not consider a diagnosis of schizophrenia in patients with more than 45 years of age. 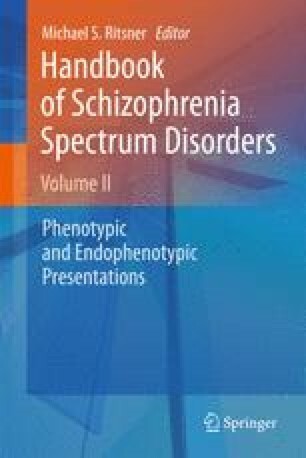 In 2000 a consensus was reached to give a specific definition to late-onset schizophrenia (LOS) for cases in the 40–60 year age range, and very late-onset schizophrenia-like psychosis (VLOSLP) for cases aged 60 years or more. There have been few community surveys of LOS, and few reported estimates for broadly defined psychotic symptoms, or, at best, for the overall prevalence of schizophrenia in the elderly. Analyses of the clinical surveys indicate that, among patients with schizophrenia, 20–30% had an onset of illness after age 40 years. The symptom profile was generally investigated through matching patients with LOS with those with early onset schizophrenia (EOS). Some studies outlined the similarities between LOS and EOS, but often LOS had fewer negative symptoms, less disorganization, and better social performance. These comparisons must be weighted for the deterioration and selective mortality of schizophrenia with early onset. Patients with LOS have a worse neuropsychological performance than healthy controls, but for some tests they show an intermediate performance between EOS and controls. Genetic studies are very few and often not specifically designed, but evidence from the larger studies indicates a lower rate of first-degree relatives affected by schizophrenia in LOS compared with EOS. Brain imaging has found that LOS has abnormalities similar to EOS, although not all studies are concordant. Indices of cerebrovascular illness did not seem to be specific. Brain imaging, EEG and neuropathological studies do not indicate that neurodegeneration or cerebrovascular illness play a major role in LOS. Evidence-based guidelines for the treatment of LOS do not exist, for these patients are too few in randomized clinical trials. The indications from experts are to treat these late-onset patients with at least half the doses used for elderly patients with EOS. After 2000 more follow-up studies on LOS were published on whether patients with schizophrenia progressed to a dementia illness. Most did not find such evidence, but some studies suggested that, for a subgroup of patients, this possibility must be considered. Theories on the etiopathology of LOS have generally hypothesized a cerebral neurodevelopmental damage, similar to EOS, that predisposes an individual to the later development of psychosis when other insults occur in later life. Future research should probably concentrate on middle-age patients with LOS, because it is difficult to find patients with VLOSLP, should correct comparisons with aged patients with EOS for factors such as selective mortality and cognitive deterioration, and clarify the paradox of good premorbid functioning of patients with LOS despite existing neurodevelopmental deficits.